Scottie Johnson is the lead pastor and church planter of the Outdoor Church of Arkansas (OCA). He and his wife have been married 19 years and will celebrate 30 years on December 17, 2014. They have two sons. Henry age 12 and Fisher age 3. Henry is Scottie and Allyce's biological son. They adopted Fisher through the "CALL" (Children of Arkansas Loved for a Lifetime) organization. Scottie has served as student pastor 23 years before he planted OCA. He is an avid outdoorsman. His wife Allyce is a music teacher in Conway and has taught music for over 16 years. 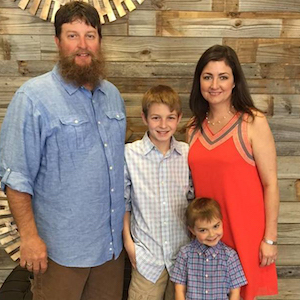 In December of 2012, Scottie and his family moved to Conway to begin the work of planting OCA. After several months of groundwork they began to meet as a core group in August of 2013. The core group met for several months, and on April 15, 2014, OCA officially launched. Outdoor Church of Arkansas is a church that is specifically reaching out to men and women and their families that have a love for an outdoor lifestyle, people who like to hunt, fish, and any outdoor activities. Many of these people really don't feel like they fit or belong in a typical or traditional church setting and OCA is trying to break that stereotype of how many churches are perceived. You can learn more about Outdoor Church of Arkansas by visiting their website, or check us out on Facebook. That we would continue to reach lost men and women and their families with the gospel of Jesus Christ. Pray that we would be able to find a space that we could make our own. A place that OCA could call home with enough room for us to continue to grow and expand what God has called us to do. Pray for OCA financially. Pray that God would bring them churches that will partner with them. Pray that God would continue to open up doors for OCA to be a part of the Central Arkansas community. Pray for Scottie and his family, as they continue to serve and lead Outdoor Church of Arkansas. This spring, OCA will be hosting a bass tournament and an archery tournament, and need volunteers to help with meals after the events. When OCA finds their own space, we will need several volunteers to help with construction projects. Projects will then include stage, children's and nursery area, indoor archery range and many other needs.